CENTRUM Católica, the business school of the Pontificia Universidad Católica of Peru, is one of the country’s leading universities with over 90 years of national and international expertise in education. The University recently celebrated its 15th anniversary, marking the opening of its first campus, Los Álamos de Monterrico en Surco. Today, CENTRUM Católica has campuses in 10 of the most important cities in Peru and is also present in Colombia and Ecuador. 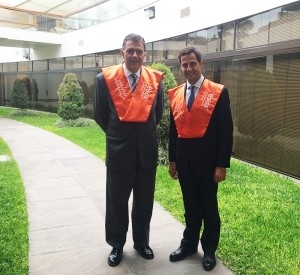 As a strategic partner of this institution in Lima, EADA decided to take part in the anniversary celebration. 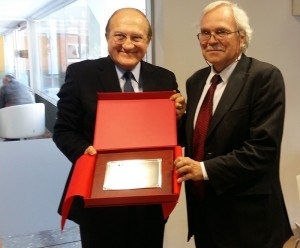 To this end, a few days ago, David Parcerisas, president of the Board of Trustees of the EADA Foundation, awarded a commemorative plaque plaque to Fernando d’Alessio, the general director of CENTRUM Católica of Peru. CENTRUM Católica is one the most important business schools in the world, having been awarded the three most important international accreditations – known as the Triple Crown –AACSB International, EQUIS and AMBA. This achievement certifies that the institution as one of academic excellence and guarantees that it complies with the highest international quality standards, whilst affirming its commitment to sustainable global development. Moreover, CENTRUM Católica enjoys a frontline position in the top business school rankings published annually by the prestigious Financial Times. EADA has seen the successful progress of CENTRUM Católica first-hand, as since 2007, the two schools have run joint specialised Masters in Administration and Managerial Skills, Projects Management, Human Potential Management, Corporate Social Responsibility, Supply Chain Management, Banking and Financial Operations, Online Marketing and Digital Business, and Retail Management.